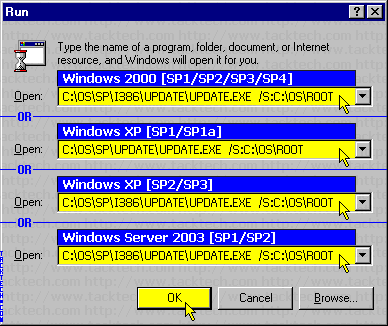 Slipstreaming Windows 2000, XP SP1/SP1a/SP2/SP3, Server 2003 SP1/SP2 (Windows 2000/XP/2003) - TACKtech Corp. 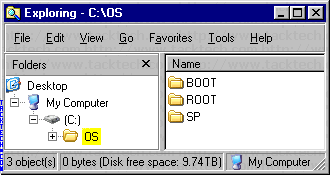 Newer version of Microsoft Windows Operating Systems (2000,XP,2003) have the ability to integrate Service Packs and HotFixes into the initial installation of the operating system. You can use this method to replace the original source files with updated Pack files before installing Windows. When the operating system is installed, the Service Pack and Hotfixes are installed automatically. NOTE: Users of Windows 2000 whom would like to unable to integrate versions of SP2 after RC1 into Windows XP will need to do different steps. Please see Microsoft Knowledge Base Article - 889719.
or Windows 2003 Server with Administrative Rights. Do not attempt using a computer running Vista. 4.) A minimum of 1GB available hard disk space. In this folder create three sub-folder called BOOT, ROOT, and SP. Note: This section is optional. Download or copy the updated Deploy Tools to the folder C:\OS\ROOT\SUPPORT\TOOLS\. Rename the deploy tools file to deploy.cab. 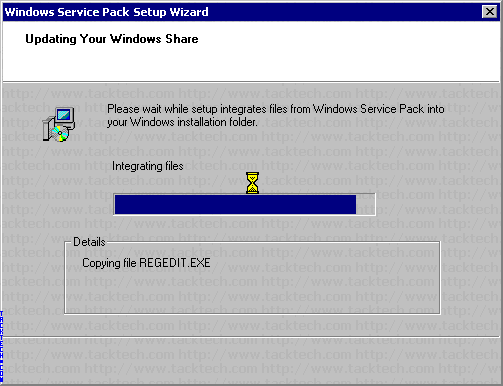 Note: The downloaded file name for Windows 2000 is SP4deploytools.exe. For Windows XP the downloaded file name changes for each language. 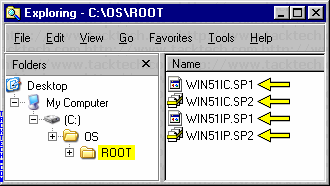 For a complete list of Windows XP Deployment Tools file names see TTID# 214. Note: This section is optional. It only applies to Windows XP SP2 and Windows Server 2003 SP1. Download the updated Support Tools. Save the file in the folder C:\OS. Rename the file to SUPPORT.EXE. When asked to overwrite the files click the Yes To All button. Note: If you are not applying a Service Pack this step can be skipped. Files will extract. Dialog will close when complete. When integration has completed successfully, click the OK button. - Remove older disc id tags. Do not remove the current SP id tag. 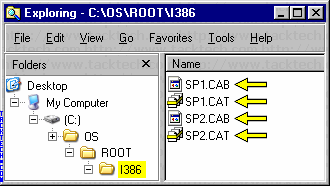 - Remove older SP CAB and CAT files. Do not remove the current SP CAB and CAT files.